This proprietary educational sport psychology assessment will provide you with a comprehensive, in-depth picture of your sport psychology skills and abilities. You have two options. You may purchase the 300-question Cole Mental Game of Sports Assessment Tool (CMGSAT) for $150, or combine this assessment instrument with a one-hour sport psychology review and coaching session with Bill Cole, CEO of William B. Cole Consultants for $250. 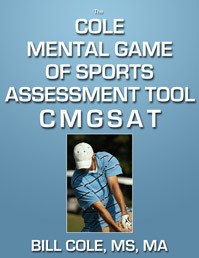 We email you our proprietary 300-question Cole Mental Game of Sports Assessment Tool (CMGSAT) as a PDF. You take the assessment, and score it yourself. It is easy to simply add up the columns and to arrive at the sub-scores and then also the grand total. You can easily and quickly see your strengths and weaknesses in each column. You then know your CMGSAT score of strengths and weaknesses. After viewing the results, if you would like coaching to address your weak areas, please contact us to set that up. The test is yours to keep and to retake again and again to see your improvement over time as you progress in your sport. Learn more or purchase the CMGSAT (assessment only). 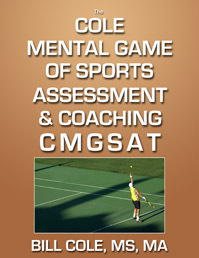 We email you our proprietary 300-question Cole Mental Game of Sports Assessment Tool (CMGSAT) as a PDF. You take the assessment, score it and return it to us. You can print a copy of the assessment, complete it and make a PDF of the completed CMGSAT and email us that as an attachment. Or you can print a copy, complete it and mail or fax it to William B. Cole Consultants at the address or fax number below. We review the assessment and then contact you to arrange your coaching session. You then have a 60-minute personal coaching conversation by phone or video with Bill Cole to review the assessment. We discuss your goals and future directions in your sport. There is no further obligation on your part to continue coaching beyond this test-coaching package (although people typically continue coaching). Many people use this assessment as the kick-off for their sport psychology coaching with us, and as a way to have an in-depth coaching conversation. Learn more or purchase the CMGSAT Assessment and Coaching Package. Return to the main Sport Psychology Coaching page.